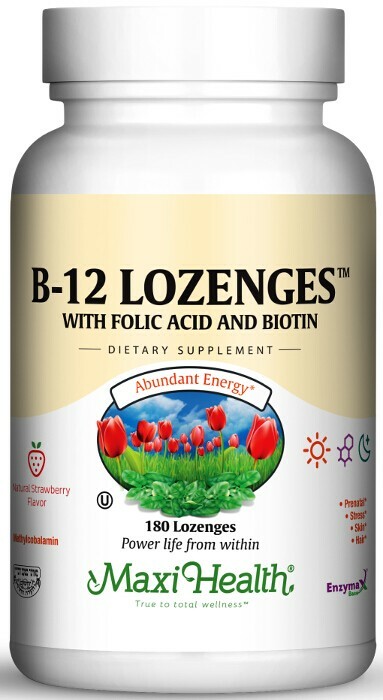 B 12 Lozenges are vitamins B-12 combined with folate and biotin. The best way to take them is just let them dissolve in your mouth. You will love the natural strawberry taste and get the powerful benefits of these three ingredients. Not only that, you get 800 mcg of each! Folate as Folic Acid is important during pregnancy. It supports cell reproduction in the developing fetus and helps prevent birth defects. It also helps support the normal formation of red blood cells and enhances the effectiveness of vitamin B12. B 12 (as Methylcobalamin) is essential for healthy nerve cells. There are two types of B-12, but the best is Methylcobalamin. It works with folic acid to support the building of the genetic materials of all cells, supports healthy cellular activity, and supports the production of enzymes. Maxi Health's B-12 Lozenges are not just for girls and women! Biotin helps maintain healthy hair and skin. It also supports protein and carbohydrate metabolism. What every you chose, 90, 180, or 360 count, get B-12 Lozenges today! Dissolve one (1) to five (5) lozenges in mouth upon arising, or as directed by a healthcare professional. Other Ingredients: Sorbitol, mannitol, microcrystalline cellulose, natural strawberry flavor, maltodextrin, modified cellulose gum, Enzymax® (calcium carbonate, bromelain, papain, lipase, amylase, protease, silica). I took B12 lozenges being a young mother of challenging kids and I felt that the B12, which I added to my multi, really helped me with energy and stress. It happened when I started having hard times. I didn't have the energy to walk home from school, carry my bags, etc. When I told my mother about it, she told me to go to sleep earlier. With no results after two weeks, it was suggested that I take Maxi Health B12 Lozenges. I highly recommend it as an excellent chewable vitamin for children and adults. My child was suffering from extreme fatigue and was diagnosed with Mono. At the health food store they recommended Maxi Health B-12 Lozenges along with DMG and Olive supreme. Within 48 hours our child was his normal self. Thank you. Maxi Health vitamins will always be #1 with me. My father had a cold and took Maxi Health B12 Lozenges and he got relief. Every time he gets a cold now, he takes them and it helps. After my third child was born I had trouble falling asleep easily and had trouble relaxing. Since I started taking B12 Lozenges in the morning, I am more relaxed and sleep peacefully. A member of our family has digestive problems. Since taking B12 Lozenges and Maxi D3-1000 they no longer need the prescribed medication. May you continue your great work helping people! I have a child that could not sit still for anything but a short time. I gave him B12 Lozenges with some other Maxi Health products and now sitting still is not a problem. Thank you. Thank you so much with providing such top quality products! My family and I are feeling much better every day thanks to you! My husband didn't always have enough energy to get through the day. Now he takes his B12 tablets every day and it gives him alot of much needed strength. Thank you! When I was 2 years old my hair was very thin. My parents gave me Naturemax Plus (Strawberry) with B12 Lozenges and now I have thicker hair. I had recurring pimples in my mouth. B-12 Lozenges solved my problem. My mouth was clear in a few days and has been since!